The Bank of America Shamrock Shuffle may not be held on St. Patrick's Day, but a few participants keep the holiday spirit alive every year at the event. The "green guys" announced their return to the 8K race again this year for the eighth year in a row. Painted head to toe in green and wearing green wigs, the "green guys" have appeared in several Shuffle photos over the years. Now, they are considered sort of mascots for the race. The "green guy" tradition began in 2008 when race participants John Atchison and Ryan Giuliano decided to paint their entire bodies green and wear only green wigs and racing shorts. They stood out in the crowd of runners, and soon other runners and spectators began referring to them as the "green guys." This year, Atchison will be joined by his fiance, Brittany Sorensen, who will be the first ever "green girl." "All of us realize that runners are a completely different breed of human," Atchison said. "No matter if they are racing competitively or helping someone get in shape, they are the nicest community I have ever been a part of. I like running PRs, but for the Shuffle, I wave my arms in the air to get people cheering. We find the fun in running." Atchison and Sorensen will be joined by two other runners, Oscar Munoz and R.J. Puoci. 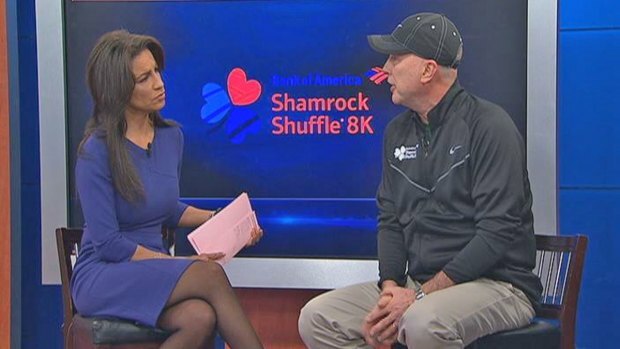 The 36th annual Bank of America Shamrock Shuffle takes place March 29 in Grant Park.